The UBC Health Awards were held on February 28, 2017. Hosted by Dr. Louise Nasmith, associate provost Health, and adjudicated by UBC Health in 2016, the awards celebrate excellence in research and collaborations between the university and community practice teams. A total of eight awards are presented and included individuals and teams from the Faculty of Pharmaceutical Sciences, G. F Strong Rehabilitation Centre, School of Population and Public Health, Faculty of Dentistry, Faculty of Medicine, and UBC Interprofessional Continuing Education. President Santa Ono provided opening remarks and presented the John F. McCreary Prize for Interprofessional Teamwork, including an honourable mention to Jason Min and Larry Leung, lecturers at the Faculty of Pharmaceutical Sciences, for their project “Clinicare Pharmacists-led Chronic Disease Management Program at Fraser Street Medical.” The Clinicare Pharmacist-led Chronic Disease Management (CDM) team at Fraser Street Medical is an interprofessional group of clinicians working in a medical office with a shared goal of providing enhanced, team-based care to patients. The team consists of pharmacists, nurses, and physicians. 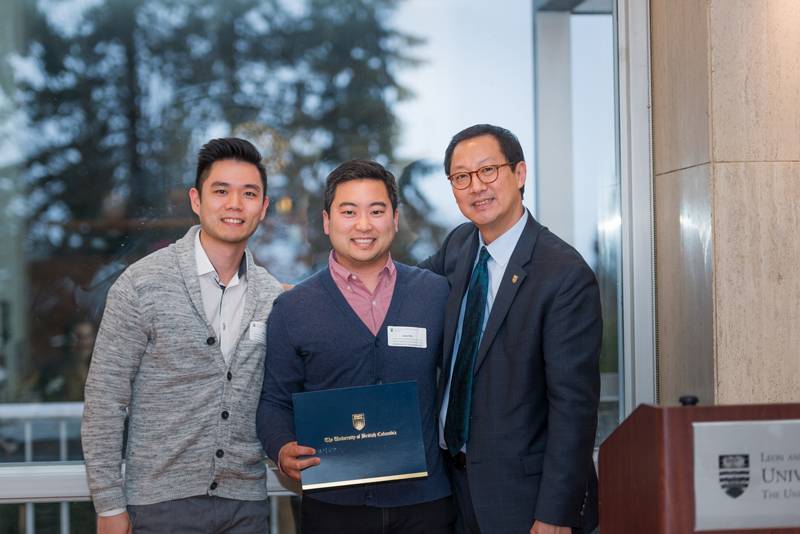 Jason Min and Larry Leung with Professor Santa Ono, representing the Fraser Street Medical Chronic Disease Management Team, who received an Honourable Mention for the McCreary Prize. Missing: Andrea Paterson, Khushminder Rai, Gurvinder Gill, Julia Cheong. Patients are enrolled in the CDM program based on criteria including minimum complexity of disease and medications. Once enrolled, patients visit regularly with the pharmacist to receive medication management, including coordination of prescriptions, requisitions, and referrals. Collaborative care conferences facilitate shared decision-making. Over 2,400 patients have received care since implementation in 2012. This award, established over 20 years ago, is intended to draw attention to Dr. McCreary’s vision of interprofessional collaboration in clinical work and education and the value of a team approach in meeting the health needs of British Columbians. 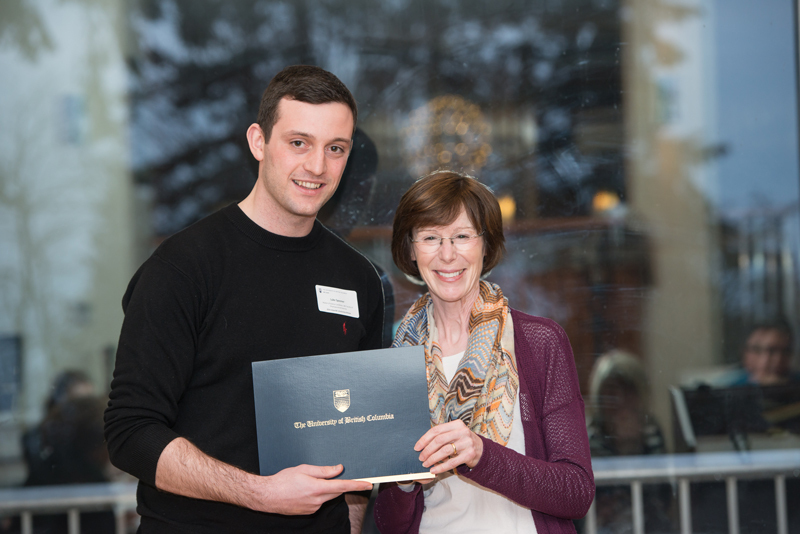 Luke Spooner, MSc candidate in the Faculty of Pharmaceutical Sciences, received an Impact BC Scholarship in Health Care Research and Development. These scholarships are made to outstanding students enrolled in a UBC Health program who have completed a research or development project focusing on patient or client involvement in health care decision-making or in health professional education. Luke’s project involved an evaluation of patient decision aids used in current clinical practice. He, along with fellow UBC researchers Dr. Mark Harrison, Madeline Bell, and Dr. Nick Bansback reviewed how uncertainty surrounding risks and benefits was described in these decision aids. Project findings highlighted the need for more empirical research to understand not only the outcomes of communicating uncertainty in patient decision aids but also the reasons for this variation in uncertainty communication. Luke Spooner with Dr. Louise Nasmith. 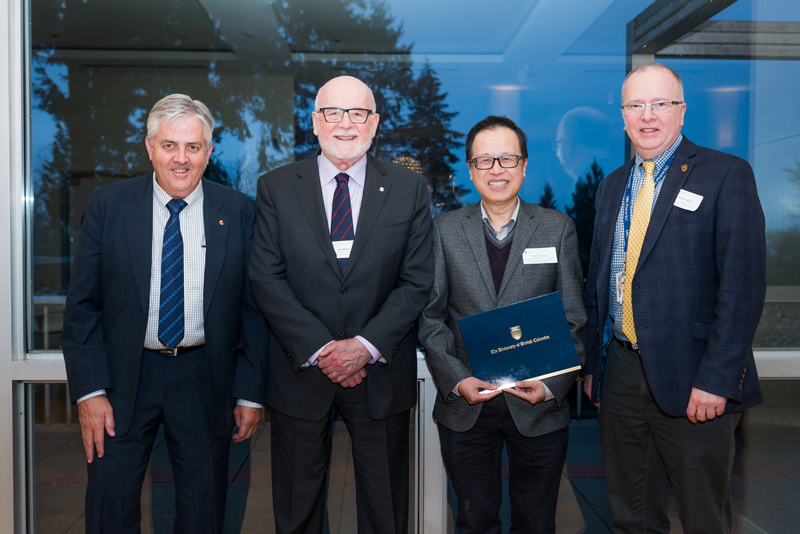 Michael Coughtrie, dean, Faculty of Pharmaceutical Sciences, presented the John McNeill Excellence in Health Research Mentorship to the 2016 recipient Dr. Peter C. K. Leung, Faculty of Medicine, to celebrate the outstanding mentorship he has provided during his distinguished 30 year career at UBC. To learn more about the award, click here. Dr. Gary Lopaschuk, Dr. John McNeill, Dr. Peter Leung and Dean Coughtrie. Dr. Leung was the recipient of the John McNeill Excellence in Health Research Mentorship Award. The program concluded with closing remarks from Dr. Angela Redish, provost and vice-president Academic, pro tem. To learn more about UBC Health, visit http://www.health.ubc.ca. Image Credit: Ivan Yastrebov, UBC Health.